With two less than spectacular sour pumpkin beers under my belt I decided it was time to try I beer that I’ve been looking forward to for a couple years now. Ever since I first discovered New York’s Southern Tier Brewing Company I’ve made it my mission to try every one of their beers that I can get my hands on. So when I saw that the GPBF was serving their autumn seasonal PUMKING I knew it had to be one of my first beers of the day. So when time came around for beer number three I think you can guess what I picked. Pumking is an ode to Púca, a creature of Celtic folklore, who is both feared and respected by those who believe in it. Púca is said to waylay travelers throughout the night, tossing them on its back, and providing them the ride of their lives, from which they return forever changed! Brewed in the spirit of All Hallows Eve, a time of year when spirits can make contact with the physical world and when magic is most potent. 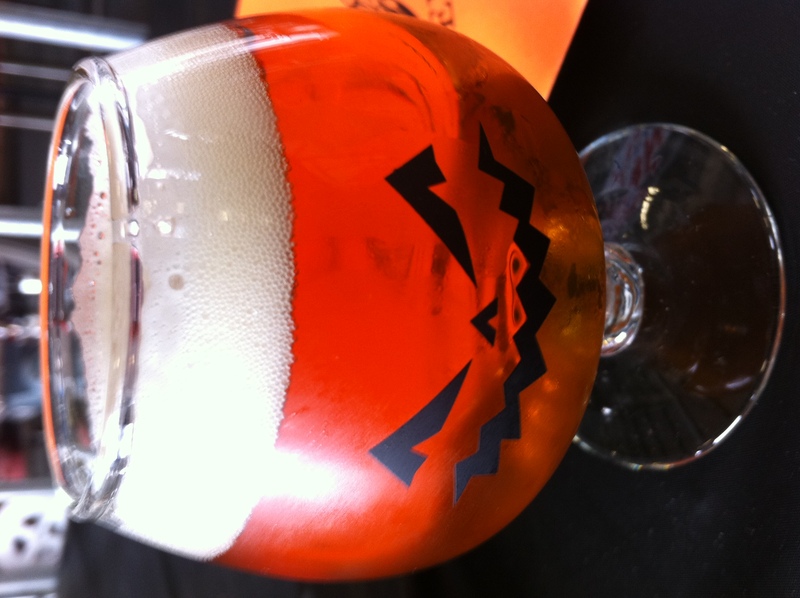 Pour Pumking into a goblet and allow it’s alluring spirit to overflow. As spicy aromas present themselves, let its deep copper color entrance you as your journey into this mystical brew has just begun. As the first drops touch your tongue a magical spell will bewitch your taste buds making it difficult to escape. This beer is brewed with pagan spirit yet should be enjoyed responsibly. Pumking pours an orangish gold with tiny bubbles passing through. Head is a but a wisp of foam that leaves a surprisingly large amount of lacing behind. Bit o’Honey is the dominate flavor in the nose of this beer, with allspice and ginger noticeable. A touch of banana is hidden in there as well. That touch of banana that appears in the nose comes through big in the taste. Honey holds its own, with the two flavors accounting for the majority of the flavor. A faint hint of allspice and ginger comes near the end, giving the beer a somewhat spicy finish. It’s kinda odd that all the flavors that are present in the nose are also present in the taste just at different levels. Mouthfeel is medium and kinda airy (not a combo you see very often). The liquid goes down easy enough and doesn’t cause too much drying or stickiness. I liked Pumking, but I didn’t love it like I expected to. This was probably my least favorite Southern Tier beer to date, but it’s still a rather enjoyable pumpkin ale.